That, to me at least, means my creative juices ran out. It’s happened to me more and more recently, and I knew it was the feeling of just being drained. With that in mind, I tried to look back. I tried to go back to a time when I was filled with complete energy. A time when inspired motivation—not blood—was running through my veins. When working 5, 6 or even 8 hours a day (on top of school work!) was actually fun and challenging. Then, I remembered. One of those “moments of incredible inspiration” hit me when I finished reading the biography of one of the greatest entrepreneurs that ever lived—Steve Jobs by Walter Isaacson. This was 5 years ago. But looking back, I feel like it was just yesterday when I flipped through 1000 eBook pages and finished it in a week. After reading, I felt like I could tackle any problem and I could literally be the next Steve Jobs (well, I was reading a Steve Jobs Biography.) Creativity was not the outcome, I didn’t need that before. But hell, I was pumped to change the freaking world. Now I look at it—and I look at my current situation—the answer now seems simple. Instead of getting mired in the tunnel vision of your imagination, by looking out into the world you improve the acuity of your peripheral vision. 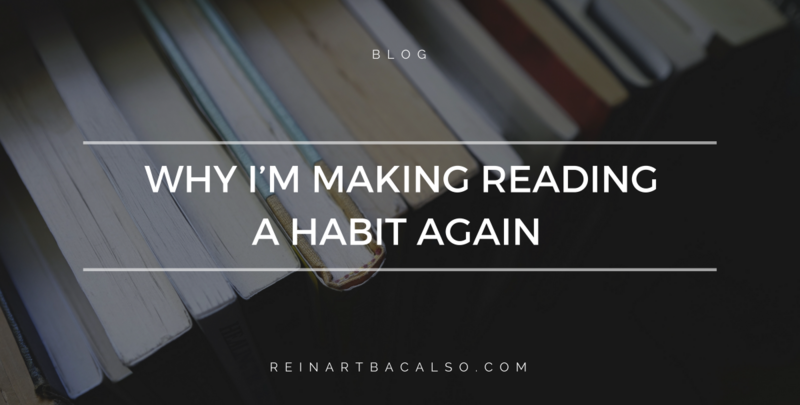 I realized that if you wanted to open up your mind and get the creative juices flowing again, reading would be one of the best ways to do it. With that, I went ahead and bought as many books as I could think of, and just told myself they were all investments. Whatever it may be, as long as you know that a purchase of something will equal to some sort of returned value to you but at a higher rate—that’s an investment. It could be books, sports gear, traveling, make-up, or even food. If you have that gut feeling you’ll get more out of it that what you spent on it, that’s an investment. I tweeted this out and made it a public challenge to myself. I love making goals public. It gives you a sense of urgency. A sense to get it done. If not, people will see you fail. If failing in public doesn’t scare you, then I need to talk to you right now. You need to teach me and 7 billion other humans how to get over ingrained human psychology. I get it—not everyone has the time or commitment to read entire books at a time. Sometimes, all you need is that little jolt of energy from a single quote/insight from an author. This is what I want to help you with. Plan is to write a bi-weekly summary and review on whatever I read. Taking out insights and the overall takeaway of the book in review. 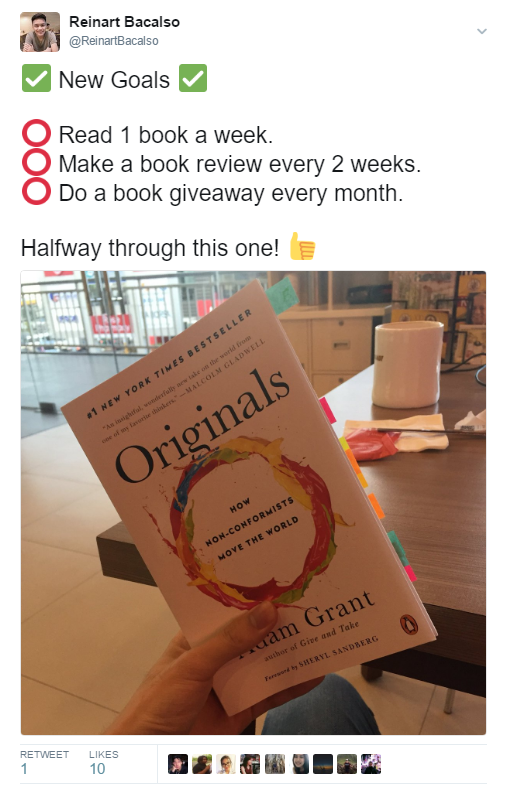 Second, would be a monthly book giveaway. I don’t have details for it yet. One thing’s for sure—I’ll be giving away a book absolutely for free every month. I’ll even ship it to you if we don’t personally know each other and we can’t meet. I hope to inspire at least one or two of you to start reading too!